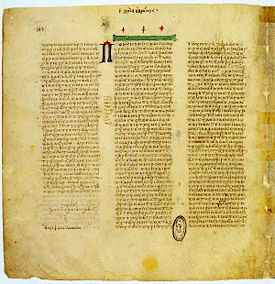 The Septuagint: A page from Codex vaticanus. Scriptures (from the Latin scriptura, meaning "a writing") are sacred texts that serve a variety of purposes in the individual and collective lives of a religious tradition. Scriptures may be used to evoke a deeper connection with the divine, convey spiritual truths, promote mystical experience, foster communal identity, and to guide individual and communal spiritual practice. Many religions believe that their scriptures originated from divine inspiration. The monotheistic faiths view their sacred texts as the "Word of God" and divine revelation. Around the world, scriptures are held in the highest regard and often defended with one's life. The scriptures of the world's religions have provided humanity with some of the most sublime and profound philosophical insights, spiritual ideals, and values that have shaped the moral and spiritual development of humankind. Indeed, the impact of scripture on world cultures is immeasurable. The lofty ideas found in religious texts have shaped the identity of entire peoples, provided the content for their legal codes, offered individuals and communities meaning to life, and explained the purpose and destination of life's journey for countless followers. Today's ready availability of scriptures of every faith tradition fosters mutual understanding and respect for the value of all religions. However, the impact of scripture has not always been positive. Excessive literalism, according to many religions, can be an obstacle to realization of higher truth. Moreover, scriptures have been used to fan the flames of intolerance, and cited to justify promote sexism, racism, slavery, and anti-Semitism. It appears that the impact of scripture will continue to be somewhat contentious and ambivalent in the years ahead. In contemporary English usage, the term "scripture" describes any religious sacred text, such as Hindu scripture, Jewish scripture, etc.. However, when capitalized in English, the word "Scripture" often refers to the sacred texts of the Bible, also referred to as Holy Scripture. "Scripture" is not limited to the written sacred word and comes in a variety of forms and styles. At different times, prose, poetry, histories and instructional manuals were all considered to be scripture. Furthermore, oral traditions, such as the Oral Torah, the early Church Gospels, and the folklore of the indigenous North Americans, among many others, were recognized as scripture by these communities. Though oral traditions may have not been written down, they still served the same role as written scripture (see below). Ultimately, it is left to the members of a religion to decide what is considered scripture within their own tradition. The first use of the Latin term "scripture" proper did not originally denote a writing of religious or spiritual significance, as the oldest sources attest. In medieval Europe, the word "scripture," implied the Bible but by the eighteenth century C.E., a growing knowledge of the world led to a wider understanding of the concept of scripture. The primacy of the written word in the Abrahamic faiths of Judaism, Christianity, and Islam can be linked to the idea of scripture and authority. Authority in scriptures is derived from the importance of the source and the unity of themes and authorship. In the Abrahamic religions the ultimate author of scripture is believed to be God, who uses human prophets to record law, teachings, and histories. The authors are also deemed important. Jewish tradition suggests that Moses recorded the Hebrew Torah, while Islamic tradition asserts that Muhammad is the transmitter of the Qur'an. Thus the concept of a "Canon" refers to any body of works that are considered to be "genuine" or "official" within a certain religious tradition. The history of scripture is a complex topic for it is tied to issues of interpretation, authority, translation, language, literacy, and even power. Only in modern times has access to the various scriptures of the world become widespread as the printing press and electronic media have made scriptures readily available to the masses for individual reading and interpretation. However, this situation has not always been the case and it is historically rare. Scriptures (in oral form) have been an important part of human culture since the beginning of civilization. From the dawn of humanity, humans have attempted to make sense of the cosmos and to explain humanity's place in it. Sacred stories arose to account for the bewildering variety of phenomena and feelings that comprise the human experience. Such stories developed cosmic significance and gave rise to the different religions and mythologies of the world's cultures. Thus, the earliest use of scripture was not in the form of written texts but ancient oral stories handed down from one generation to the next. Many ancient preliterate cultures (and some modern ones) did not place a strong emphasis on recording their "truths" in written documents, preferring instead to honor their sacred stories through oral memorization and transmission. In ancient India, for example, the body of sacred literature known as Smriti was handed down orally among the Hindus before eventually being written down. In the time before literacy was widespread, the average lay adherent of any religion would likely come to know the sacred stories of their own tradition through folklore, worship and ritual, or from literate members of the clergy who would read passages from their scriptures. While those able to read and explain the scriptures were held in high esteem—those who could recite them from memory even more so. Religious instruction in the ancient Brahmin caste of India included a set of mnemonic tools that helped students to memorize the ritual formulae found in the Vedas, which were written down relatively late in Hindu history. Similar (but unrelated) systems were used in the recording of the Qur'an. The Hebrew Bible, recorded in the ancient Hebrew language, is in its original rendering written in such a way that it is recited with a pleasing rhythm. The ascendancy of written scriptures in the world's religions developed along side the continuation of oral traditions. In Judaism, for example, the earliest example of written scripture is the Torah, which is said to have been given to Moses by Yahweh. The Torah became the foundational scriptural bedrock of the Abrahamic traditions; yet even the Torah continued to be supplemented by additional oral traditions in Judaism known as the Mishna. The oldest portions of the Zoroastrian Avesta are also believed to have been transmitted orally for centuries before being put in written form. Though widely differing dates for Gathic Avestan (the language of the oldest texts) have been proposed, scholarly consensus floats at around 1000 B.C.E. (roughly contemporary to the Brahmana period of Vedic Sanskrit). Historical evidence suggests that the Rig Veda was composed roughly between 1500–800 B.C.E., making it one of the world's oldest religious texts. When Prophet Muhammad received parts of the Qur'an from Gabriel, he would later recite the verses so that they could be recorded on palm leaves, though many in attendance would commit the verses to memory as well. However, it is recorded that following the death of the prophet, under the Caliphate of 'Uthman in the mid-600s C.E., debate broke out concerning variant versions of the Qur'an. 'Uthman ordered that the written versions be collected and compared against one another, as well as against the recitations of those who had memorized them. All this information was later redacted into what is known as the 'Uthmanic Codex, the Qur'an that is used today. Translations of scriptures may receive official blessing in order to further disseminate doctrine. Buddhism is a prime example of a tradition that encouraged translation—as Buddhism spread texts were translated from Pali and Sanskrit to Tibetan, Chinese, Japanese, Korean, Thai, and Vietnamese, among other languages. Many texts exist now only in translation. The need to translate was often a motivating factor in the development of written language—the Tibetan and Thai writing systems were in part developed to record Buddhist works in those languages. However, translation is not always encouraged—an original sacred language often has de facto, absolute or exclusive paramountcy. The Qur'an of Islam is a text that, though translated, is thought to be only truly inspired by God when read in its original Classical Arabic. The Vedas of Hinduism are also strongly connected to their original language (Sanskrit), due to both the importance of sound in Indian spiritual thought, and to the Vedas long preservation only in oral tradition. At times translations can be believed to be just as important and inspired as the original text, as in the case of the Septuagint, a translation of the Hebrew Bible into Koine Greek, revered by Hellenized Jews around the first century B.C.E. Policy regarding translation has an appreciable impact on the growth of a tradition, especially in early stages. Critical points in Protestant Christian history were the translations of the Bible by John Wycliffe and Martin Luther into their respective vernacular languages. The grammar, vocabulary and style of scripture often become the standard against which later language is judged. This is especially true of the Qur'an, which is considered by the Muslim world as the finest use of Arabic, though modern colloquial Arabic is somewhat removed from the language of the Qur'an (as is expected—any language that endures is likely to evolve). In imperial China the Classics (jing 經) were looked upon by educated Confucians as perfected writings, with style to which they would aspire to emulate. Even the King James Bible, itself a translation, is widely revered by many modern English speaking Christians. In Christianity, prior to the Protestant Reformation, the interpretation of the Bible was in the hands of the clergy. The Reformation, however, took scripture out of the hands of the priests and bishops and put it into the hands of the individual. This is not to say the change was immediate—rates of illiteracy were still high in Reformation era Europe, and the reading of scripture was not entirely practical for all Christians. As well, this was not solely a Protestant development, as the Catholic and Orthodox churches would both follow, in time. A major step in the accessibility of the Bible was the decision by Protestants to translate and release it in the vernacular (local) languages of the time, rather than leave it in the Latin, Greek, or Hebrew used only by the intellectual elites of that era. The prior advent of the printing press by Johannes Gutenberg in 1440s also helped to disseminate texts more rapidly. In modern times, the study of Scripture has become an academic pursuit in universities. Increasingly, sacred texts of many cultures are studied within academic contexts, primarily to increase understanding of other cultures, whether ancient or contemporary. Even for casual readers, the ready availability of scriptures of every faith tradition has done much to foster mutual understanding and respect for the value of all religions. Spiritual seekers, whatever their faith, find valuable insights in the world's scriptures to guide them on their path. Academic study of scripture includes the applying the methods of biblical criticism to understanding the authorship and history of scriptural texts. First developed in Christian biblical studies in the nineteenth and twentieth centuries, today the principles of biblical criticism are being extended to the texts of many faiths. These methods generate intense controversy among communities of believers, and have encountered rejection from conservative Christians, and increasingly, from Muslims. Nevertheless, critical exegesis (interpretation of a text, especially within its original context) is crucial for adherents of a religion to better understand their scriptures, especially as the context in which it was written illuminates the meaning of a text. Scripture serves a variety of roles in the spiritual life of a religious community. There are three major functions of scripture in a religion: personal guidance and inspiration, communal worship and instruction, and bibliomancy (using scripture for magical purposes). Though limited literacy and primitive copying methods prevented the widespread dissemination of religious texts for many centuries, scripture has always had a personal aspect—at least, for those with access to it. In modern times, with the promotion of literacy and the advent of printing (and telecommunications) many individuals are able to experience the scriptures from their own traditions first hand. Following the greater access allowed by the advent of the printing press, most religious traditions now place a great emphasis on devotional reading of religious texts. For example, an individual relationship with the Qur'an has always been a focal point for practicing Muslims. A hafiz ("memorizer" or "protector") is one who has committed the entire Qur'an to memory. Though this skill is of great use within a communal setting, it cannot be achieved without a great personal commitment. The community also sees it as a great act of personal piety. The Lutheran insistence on "sola scriptura" (by scripture alone) highlighted the individual's perceived need for scripture in the faith of a Christian. In many religious communities scripture forms the basis for their social, legal and moral codes of conduct, as well as providing instruction on rituals and rites of passage. Scripture also serves as the foundation of law for some religious communities. The Qur'an and the hadith (traditions) are outstanding examples of scripture used as the foundation of law (Sharia) in Islam, as is the Torah of Judaism. In both cases we find rules for the proper conduct of the pious, including (but not limited to) the treatment of spouses, children, the poor and enemies. The Vinaya writing of Buddhism also fulfills a similar role, serving as rules for those who are practicing within a monastic community. The use of scripture for magical ends has been widespread amongst the world's religions, though often times not sanctioned by governing bodies or the clergy. Frequently, scriptures have been pored over for secret information encoded in a myriad of different ways, likely unrelated to the text that appears in plain sight. Those searching for secret messages are confident of the divine nature of the book, even the information that appears for everyone to see; however, they also believe that in the divine creation of scripture, secrets are planted in the text for the devout to discover. This is found in the Jewish Kabbalah tradition, which attempts to reveal mystical messages hidden in the Hebrew Bible. In recent times there has been a surge of bibliomancy in Christian and Muslim circles, each with their own re-examination of scriptures. Most notable is the "Bible Code" phenomenon, in which passages from the Hebrew Bible are arranged in a pre-determined way (often a specific number of characters per line, without spaces) and checked for key words, found by counting letters at certain intervals. Both the number of characters per line and the intervals at which letters are counted are manipulated, often requiring a computer to handle the multitude of calculations. Sometimes the alleged Bible Code is used for predicting future events. Bibliomancy does not always fall outside of the proscribed use of scripture for the Daoist classic the Yi Jing (易經) is, at least on the surface, expressly used for divination. Thus, attitudes to sacred texts differ between religious traditions, and can change within a faith group. Some religions make written texts widely available, while others hold that sacred teachings must remain hidden from all but the loyal and the initiate. Some religions make texts available gratis or in subsidized form; others require payment. The Guru Granth Sahib of Sikhism always appears with standardized page numbering while the Abrahamic religions and their offshoots favor chapter and verse pointers. Scripture plays the central role in the Abrahamic faiths of Judaism, Christianity, and Islam that have been called "religions of the book." In these religions scriptures are attributed to prophets: Moses as the transmitter of the Torah, and Muhammad as the transmitter of the Qur'an. Christian tradition attributes the canonical gospels to disciples of Jesus. In Hinduism, the Vedas are thought to have been recorded by rishis. Though all these traditions accept that their texts were recorded by human hands, they also believe that these works are in some way "heavenly books." This assertion has different meanings in different traditions. The Qur'an is believed to be of complete divine origin, recited by Muhammad after having it revealed to him by the angel Gabriel. The Vedas of Hinduism are not thought to have been composed by the rishis, but rather heard. The Buddhist tradition sees the power of their scripture in its insight into the nature of reality. The Hebrew Bible (Tanakh) is comprised of three major sections: the Torah (law), the Nevi'im (Prophets), and the Ketuvim (Writings). The Hebrew Bible is thought to have been established at the Council of Jamnia following the destruction of the Second Temple in 70 C.E., though some dispute that this council ever occurred. The Tanakh is an example of a collection of scriptures written at different times by different authors in different locations. However, the various writings are thought to be equally inspired by God, and thus are said to have unity in spirit and consistency. Within Judaism there is also a strong oral tradition, preserved in the Talmud; however, there is disagreement within the Jewish community as to the importance of the Talmud. The Talmud is made up of the Mishnah, the recorded oral law, and the Gemara, commentaries on the Mishnah. Another work sometimes recognized as scripture in Judaism is the Zohar, a collection of mystical writings used in Kabbalah. 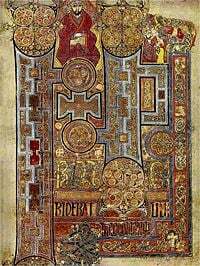 Several highly artistic and illuminated Biblical manuscripts were produced during the Middle Ages such as the Book of Kells shown here. The central scripture to Christianity is the Holy Bible, made up of the Old Testament (Hebrew Bible) and the New Testament. The Old Testament is the same as the Jewish Tanakh, recognized as scripture by early Christians. The New Testament is a collection of writings by early Christians, comprised of narratives, letters and apocalyptic writings. Among Christian denominations there is some disagreement about the contents of the canon, primarily in the Apocrypha, a list of works that, though not considered fully scriptural in any major Christian denomination, are regarded with varying levels of respect. As well, there exists a group of somewhat unrelated works known as the Pseudopigrapha—texts whose authorship is attributed wrongly to others. Attitudes towards the Bible also vary amongst Christian groups. Roman Catholics, Orthodox, and many Protestant groups stress the harmony and importance of scripture and tradition, while other Protestant churches focus on the idea of sola scriptura, or scripture alone. This concept arose during the Protestant Reformation, and many Evangelical groups today continue to support the use of scripture as the only source of Christian teaching. The central scripture of Islam is the Holy Qur'an, which was recorded in the seventh century C.E.. Islamic tradition holds that the Qur'an existed in its same form in heaven before its revelation to humanity by the angel Gabriel through Muhammad. There is a great deal of importance attached to the integrity of the Qur'an, especially the degree to which the original text has been preserved over the centuries. Additionally, the ahadith (the Arabic pluralization of hadith), which record the words and actions of the prophet Muhammad, is another revered text in Islam. However, the hadith are not considered as authoritative as the Qur'an. Muslims also recognize the Hebrew and Christian Bibles as scriptural, but corrupted by humanity over time, and not maintaining the purity of the Qur'an. Thus, Jews and Christians are known in Islam as 'People of the Book." Hinduism is a broad and vast religion, both in terms of beliefs and time. thus, speaking of "Hinduism" is difficult, as the term itself encompasses a vast variety of beliefs and scriptures. There is a great deal of material, both oral and written, that is considered scriptural in the Hindu traditions. The oldest and most authoritative scriptures in Hinduism are called the Vedas, meaning "Wisdom texts." There are four collections (Samhitas) of Vedas: the Rig, Yajur, Sama, and Atharva. Each of the Samhitas is further connected to commentaries that elucidate these works known as the Brahmanas and Aryanakas. The highest or ultimate teachings of this corpus are known as the Upanishads, which are of great importance philosophically, and thus classified as "Vedanta" (culmination of the Vedas). The entire collection of Vedic texts is classified in Hinduism as shruti, meaning "heard wisdom." In addition to the Vedic "shruti" scriptures, several other Hindu writings are revered as scripture. Collectively these other writings are known as smriti ("remembered wisdom"). Included among these works are the Itihasa (Sacred History epics) of the Mahabharata and the Ramayana. A chapter of the Mahabharata called the Bhagavadgita has become the most popular and widely read scripture in Hinduism today. Other smriti texts include tantras, agamas, legal sutras and shastras, and the texts of philosophical schools. There is no set of scripture that is universal throughout all of Buddhism. Most traditions have a tripitaka (Pali tipitaka), a Sanskrit word meaning "three baskets." These baskets refer to the three categories of scripture found in most Buddhist organizations: the vinaya pitaka (discipline and rules for monks and nuns), the sutra pitaka (sermons and teachings by and about the Buddha), and the abhidharma pitaka (a structured presentation of Buddhist teachings). The first tripitaka was the Pali Canon, recorded in the first century B.C.E. from oral tradition. This set of teachings makes up the scriptures used by Theravada Buddhists. As new schools of Buddhism developed new canons were prepared. The Mahayana Buddhist tradition produced sets of works thought (by Mahayana Buddhists) to be superior to the Pali Canon, but still a product of the Buddha. These included the Prajnaparamita sutras and the Yogacara sutras. Some of these texts were believed to have been created by the Buddha, but preserved by mystical beings known as nagas and revealed only at the appropriate time. In China and Tibet, even further canons were created, incorporating new ideas through the inclusion of new texts. In the Tibetan Nyingmaj tradition special texts called terma are believed to be occulted and revealed in a manner similar to some Mahayana works. In Buddhism, the term "sutra" refers to canonical scriptures. The earliest Buddhist sutras are found in the second part of the Tripitaka which is called Sutra Pitaka. There are also some Buddhist texts, such as the Platform Sutra, that are called sutras despite being attributed to much later authors. The Pali form of the word, sutta is used exclusively to refer to Buddhist scriptures, particularly those of the Pali Canon. The Confucian tradition does not have scripture in the sense that other religions do—that is, Confucians did not see their books as necessarily heavenly or divine. They did, however, still ascribe great value to them. The works in the Confucian tradition that are analogous to scripture are best described as "classics." There is debate as to whether these Classics can be described as scripture, just as there is debate as to whether Confucianism itself can be described as a religion. The important books of Confucianism are divided into the Five Classics and the Four Books. The Five Classics are not specifically Confucian, but do relate strongly to Confucian teachings and values. The Five Classics are the Classic of History, the Classic of Poetry, the Classic of Rites, the Spring and Autumn Annals and the Yi Jing (I Ching), the last also being an important text in Daoism and folk traditions. The Yi Jing, Classic of Poetry and the Classic of History were recorded (in some form) before Confucius' work, though he is thought to have written the Spring and Autumn Annals and edited other volumes. The Classic of Rites was compiled by subsequent Confucians. The Four Books of Confucianism are the Analects (sayings of Confucius), the Mengzi (Mencius) (written by the disciple of that name), the Doctrine of the Mean and the Great Learning—the latter two are part of the Classic of Rites. Philosophical Daoism's primary text is the Dao De Jing (Wade-Giles: Tao Te Ching). Attributed to Laozi (Lao Tzu), it is often dated to around 600 B.C.E. and expounds on themes of nature, ruling, and knowledge, among others. Also important is the subsequent work the Zhuangzi (Chuang Tzu), written by an author of the same name. Written approximately 200 years after the Dao de Jing, the Zhuangzi addressed similar themes, which became paramount in the thought of philosophical Daoists. The Classic the Yi Jing (I Ching), though not specifically a Daoist work, would become central in Daoist practice as well. Along with the developments in Daoism new texts were written and popularized. The alchemist Ge Hong wrote the important work the Baopuzi ("Sage Who Embraces Simplicity"), and as alchemy grew in importance in Daoist thought, alchemical works grew in popularity as well. Daoist works since the fifth century B.C.E. have been arranged and rearranged in a canon known as the Daozang, which includes a great variety of Daoist works on a myriad of topics. The most important work in the Sikh religion is the Adi Granth or Guru Granth Sahib, written in the Gurmukhi script. The Adi Granth was compiled in its final form in 1604 by the fifth Guru Arjan. Subsequently the Adi Granth was expanded by later Sikh gurus, eventually becoming the Guru Granth Sahib as it is known today. The last of the Sikh gurus (Guru Gobind Singh) declared that the Granth would serve as guru for the Sikh tradition—a unique role for scripture in the world's religions. Also unique is the reference system used: while many traditions (especially those of the West) use a chapter and verse system, the Guru Granth Sahib's composition is standardized in such a way that every instance of the book has the same number of pages (1430) and the same text on every page. Thus, when searching for a particular page in the Granth, the universal reference is a page number, rather than a chapter or verse citation. In addition to the Guru Granth Sahib, Sikhs hold the Dasam Granth in high esteem. This work records the teachings of Guru Gobind Singh. Many new religious movements have their own canons of scripture, deemed to be invaluable to their community, and the world at large. The Church of Jesus Christ of Latter-day Saints considers the Book of Mormon to be sacred scripture in addition to the Holy Bible. They also hold in deep esteem other texts titled, The Doctrine and Covenants, The Pearl of Great Price, and the Articles of Faith. The Baha'i Faith holds the Book of Certitude to be scripture, among other texts. The Unification Church views the Divine Principle, along with the many sermons of Rev. Sun Myung Moon, to be scripture. Many new religions have an open canon, meaning that new revelations may become scriptural. Some have suggested that the writings of Marxism-Leninism and the United States Constitution have a quasi-religious nature, playing a similar role in society as religious scripture. Indeed, some secular writings speak of transcendent and unchallengeable truths, and justify any social action in reference to these texts which serve as their foundation documents. It can be argued that these forms of "scripture" have or have had as much of an impact on the social behavior of their societies as religious scriptures have for their adherents. Furthermore, both the United States Supreme Court and Marxist-Leninism have figures comparable to "high priests" (e.g. the Supreme Court, the "Nomenklatura"). Hermeneutics may be described as the development and study of theories of the interpretation and understanding of texts, especially scriptures. However, it is more broadly used in contemporary philosophy to denote the study of theories and methods of the interpretation of all texts. The concept of "text" is here also extended beyond written documents to any number of objects subject to interpretation. A hermeneutic is defined as a specific system or method for interpretation, or a specific theory of interpretation. The word hermeneutics is a term derived from 'Ερμηνεύς, the Greek word for interpreter. This is related to the name of the Greek god Hermes in his role as the interpreter of the messages of the gods. Hermes was believed to play tricks on those he was supposed to give messages to, often changing the messages and influencing the interpretation thereof. The Greek word thus has the basic meaning of one who makes the meaning clear. A common use of the word hermeneutics refers to a process of scriptural interpretation. Throughout religious history scholars and students of religious texts have sought to mine the wealth of their meanings by developing a variety of different systems of hermeneutics. Philosophical hermeneutics can be seen as a development of scriptural hermeneutics, providing a theoretical backing for various interpretive projects. Rabbi Ishmael (90-135 C.E.) of the Amoraic era of Judaism interpreted laws from the Torah through 13 hermeneutic principles. This is the first appearance of hermeneutics in the world, through the exegesis interpretation of Biblical texts. Despite the fact that the scriptures of the world's religions have given humanity some of the most sublime and profound philosophical insights, spiritual ideals, and values that have shaped the moral and spiritual development of humankind, scripture also has a dark side. The impact of scripture on human behavior has not always been positive. Religions themselves are critical of those who hold to a literal reading of scripture which can block comprehension of the spirit of God behind it. Thus Saint Paul preached against those whose fidelity to the (Jewish) Scriptures created an obstacle to receiving Jesus; he wrote: "The written code kills, but the Spirit gives life" (2 Corinthians 3:6). The Buddha in his Parable of the Raft spoke about the scriptures as a raft—useful on the path to Enlightenment but ultimately to be abandoned on the other shore—as true enlightenment transcends conceptual knowledge (Majjhima Nikaya 1.134-35). I have yet many things to say to you, but you cannot bear them now. When the Spirit of truth comes, he will guide you into all the truth (John 16:12-13). Every term has a Book. God blots out, and He establishes whatsoever He will; and with Him is the Essence of the Book. Whether We show you a part of that We promise them, or We call you unto Us, it is you only to deliver the message, and Ours is the reckoning (13.39-40). The various scriptures have sometimes been used to fan the flames of intolerance and violence, promote sexism, racism, slavery, and anti-Semitism. While faulty interpretation of scripture is often responsible for these evils, some scholars suggest that the roots of violence, racism, and anti-Semitism are actually inherent in scriptures themselves. Thus, it appears that the impact of scripture will continue to be somewhat contentious and ambivalent in the years ahead. Another criticism of scripture is the charge of bibliolatry. Bibliolatry is the elevation of a scripture, in the minds of adherents, to a level of worship. This elevation is most often an unconscious act and not supported by orthodox teachers. The accusation of bibliolatry is not always a fair one; though there are strict codes of conduct in handling Torah scrolls or copies of the Qur'an, it is not accurate to assert that any people following these codes actually worship the text. Technologies such as the Internet, television, and computers have changed the way and frequency with which information is shared, including scriptures. Most of the world's religious texts and classics have been stored electronically on the Internet, and are available to be read in many languages. Additionally, many scriptures, such as the Bible and the Ramayana, among others, have been dramatized on television or in Hollywood movies. In the twenty-first century, scripture is becoming increasingly “digitalized” so that those with computers can access any of the world's religious texts (in translation or in the original languages). ↑ William A. Graham, "Scripture" in The Encyclopedia of Religion, edited by Mircea Eliade. (MacMillan Reference Books, 1987, ISBN 0028971353), 135. ↑ World Scripture: A Comparative Anthology of Sacred Texts. (New York: Paragon House, 1991. ISBN 0892261293), 569-578. Monier-Williams, Monier. A Sanskrit-English Dictionary. Motilal Banarsidass, 1899. Judaica Press Translation - Online Jewish translation of the books of the Bible. – The Tanakh and Rashi's entire commentary. Ocean – Downloadable and searchable database of world religious texts. Extensive Bahá'í, Buddhist, Christian, Hindu, Islamic & Jewish libraries in seven European languages. This page was last modified on 25 August 2015, at 14:39.